The Global Executive classroom travels across a diverse set of economies that demonstrate the interdependency of global business: Asia, Europe, Latin America, and the United States. In each location you’re encouraged to explore and be adventurous, gathering data that will inform concepts discussed in the classroom—for example, negotiating the price of vegetables at a local market and mapping that vendor's supply chain. Touring Wenco Manufacturing, you’ll meet with its Managing Director, a Fuqua alumnus who discusses how the company has become the leading plastics manufacturer in Latin America. You’ll see life through the eyes of a former street kid during a walking tour of the inner city of Pahargani, then learn how an NGO is working to protect these children. In discussion with former Duke basketball player and SVP for Programming and Production at NBA China, you’ll learn the organization’s business strategy and explore how they build brand abroad. Meeting with Duke alum and editor-in-chief of Handelsblatt—the leading national business and finance daily—you’ll discuss the transformation of the German economy, from reunification through Brexit. Fuqua has invested in an extensive network in the regions where you’ll learn. We’ve recruited regional advisory boards and built relationships with leading firms and executives in each country who help us better understand macroeconomic drivers in each location. You’ll have a global experience well informed by local insights. 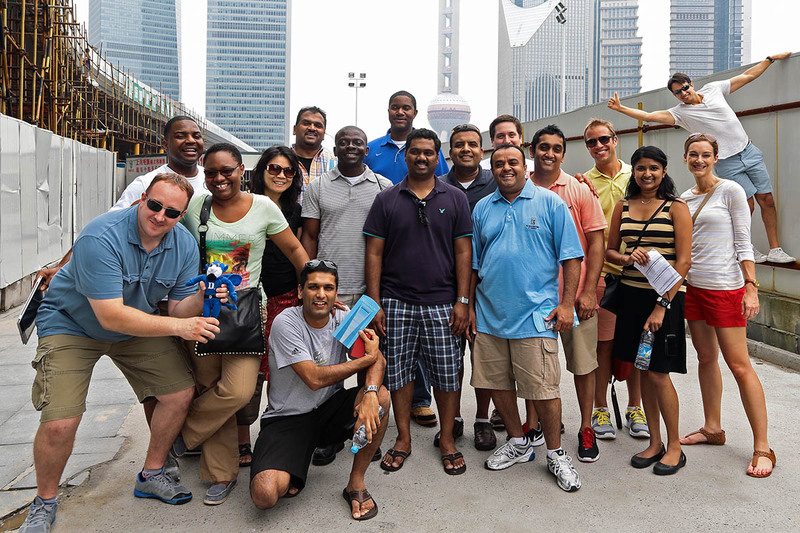 Fuqua's in-country regional teams help you navigate nuances in different cultures and connect you with regional business leaders. We have physical offices in key locations, as well as teams of professionals focused on building our relationships in Asia, Europe, India, and Latin America. The members of our advisory boards in East Asia, Europe, Russia/CIS, Middle East/North Africa, India, and Latin America are senior executives representing different industries and countries across each region. Each board’s purpose is to advise on matters related to curriculum, programs, and operations, with a focus on promoting relationships within the business community across the target region. Board members directly impact your program by facilitating our relationships with key business and government entities in their country, and they’ll often also interact with you in events during your residencies. Durham is an eclectic city, with a diverse mix of historical and cultural places, offbeat shopping, sports venues, arts festivals, houses of worship, and great restaurants. Known for everything from laid-back Carolina BBQ joints to charming donut shops and trendy microbreweries, Durham was voted America’s foodiest small town by Bon Appétit. Within just a few hours’ drive from campus are the Blue Ridge Mountains for hiking and mountain activities, the Atlantic coast for beaches and water sports, or the NC Sandhills area for champion golf. Washington, D.C. is just 4 hours by car—or hop a 1-hour flight to New York City or a direct flight to most places in the world. You’ll spend two residencies on Fuqua’s campus in Durham, where you can enjoy the cultural events, sports, and other activities that Duke University has to offer. During your stay in Durham, you’ll live, learn, and work in the four-star JB Duke Hotel, which also encompasses the R. David Thomas Executive Conference Center, 198 guest rooms and suites, a full-service restaurant, two bars, a fitness center, and other amenities. The R. David Thomas Executive Conference Center originally opened in May 1989 and is named after the founder of Wendy’s International, Inc. The JB Duke is connected to the main Fuqua building by covered walkway. The Ford Library provides a serene, comfortable environment for quiet, focused study in a relaxed atmosphere. The library is designed for reader comfort, with abundant natural light, comfortable seating, and generous display space. All students are encouraged to tour the library to learn about the resources available to you. Librarians will offer tours during your orientation and can provide database instruction throughout your program. What Does a Student’s Day Look Like? From corporate speakers to exploring the local culture, a student shares highlights from a day in Shanghai.